A young person in the United States who embarks on adult¬hood without a high school diploma faces a grim economic future: an annual income that is likely to be insufficient to support a family, a greater likelihood of long stretches of unemploy¬ment, and restricted opportunities for occupational advancement. Cities with large percentages of youth who lack high school diplomas suffer as well: they can take advantage of fewer economic devel-opment opportunities, garner less tax revenue, and experience higher social service costs, more crime, less civic participation, and high levels of concen-trated and inter-generational poverty. A city of the 21st century cannot prosper when large numbers of its young people lack this basic academic credential. Despite the serious individual and collec-tive costs that result when youth fail to complete high school, until now we have not had a clear picture of how many stu-dents in the Philadelphia public schools earn their high school diplomas and how many drop out of school. Data are critical for assessing the numbers of dropouts and their characteristics, and ultimately for determining whether we are succeed-ing in our efforts to retain students in school and to reconnect dropouts with educational opportunities. How Does Access to Childcare Affect High School Completion in Philadelphia's Multiple Pathways to Graduation Programs? 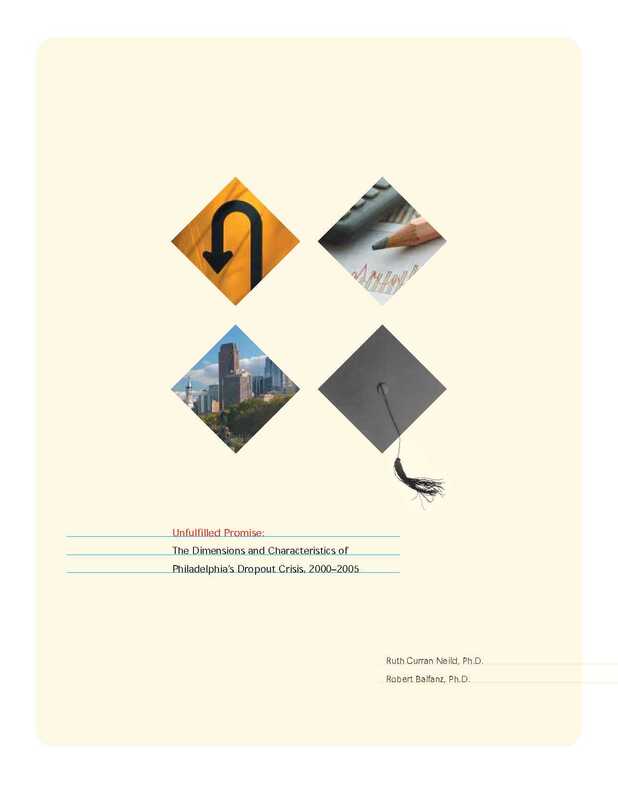 There are roughly 15,000 young Philadelphians who lack a high school diploma and are not currently enrolled in school or employed in the labor force.